Children all over our region are gearing up to get dirty at school! School gardens, also known as teaching gardens, eco labs, outdoor classrooms, edible schoolyards, etc., are becoming an integral part of daily curricular activities. Teachers are engaging students with inquiry driven science and social studies lessons while learning how to cultivate and enjoy local food. Schools gardens come in all shapes and sizes. A small window box sprouting peas can be just as effective as a large outdoor garden, depending on the goals and scope of the project. Some schools are even installing edible forest gardens, also known as Permaculture Orchards, or food forests. 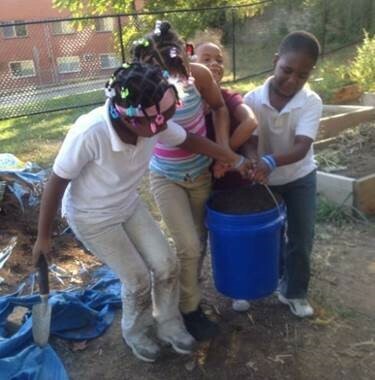 Schools, youth organizations, and even community groups often build garden programs to match the unique nature of their community and available local resources. No matter what form a school garden takes, each has the potential to introduce the wonder of growing to younger generations and bring local food to the communities that tend them. School gardens are a crucial teaching tool offering essential experiences for students to interact with the natural world and gain confidence in their ability to conserve and restore environmental resources. Taking students outdoors can present new challenges for teachers, however, the benefits for students are numerous and potentially life changing. Students benefit physically through gross and fine motor movement while being mentally stimulated. Studies have shown that increased outdoor experience leads to improved student balance, eyesight, and test scores. School gardens provide a safe space for children to experiment with the variables of nature and the end result is often a tasty treat. I’ve seen children who struggle to focus indoors thrive outdoors. Their high energy has room to roam and nature is a valuable co-teacher, providing teachable moments as birds fly through the sky, and the wind rustles tree leaves. There is no limit to what can be taught outdoors. Creative thinking and a new perspective can open up new ways to approach traditional topics. School gardens are expanding in numbers and in growing time. The Civic Garden Center works with 103 local school garden programs. We encourage teachers and students to embrace four season gardening. This is accomplished by planting cool season crops in the fall, enjoying an early winter harvest; utilizing low tunnels, cold frames, and green houses to lengthen the season; planting cool season crops in the spring, enjoying a late spring harvest; and cover cropping with legumes in the summer. We help teachers through our free training workshops (including free seed distribution events), blog posts, monthly calendars and offering onsite consultations and standards-based lessons for students. Our region is rich with resources ranging from a deep agricultural heritage to a growing number of urban farms. A wide range of grant and fundraising opportunities supply revenue for garden installations and expansions, bolstering the school garden movement nationwide. While most schools focus on growing edible plants, there are many benefits of incorporating native pollinator plantings, orchards, five senses gardens, and more into the schoolyard ecosystem. School gardens reach out beyond the school. Neighbors come together in the garden. A community garden that includes areas for students to experiment is an ideal collaboration. Inviting local experts to work with the students and teach them advanced methods of agriculture and culinary arts is one way to expand the reach of the school garden beyond the schoolyard. Families can support the work of teachers and students by maintaining the garden during school breaks and keeping common areas weeded and watered. Weekend and evening events in the garden build community as neighbors meet and grow together. Local businesses can support the school’s efforts by donating supplies and staff volunteer time. These connections elevate the garden from a school exclusive to an integral part of the community. Contact us for more ideas on ways to involve community partners! 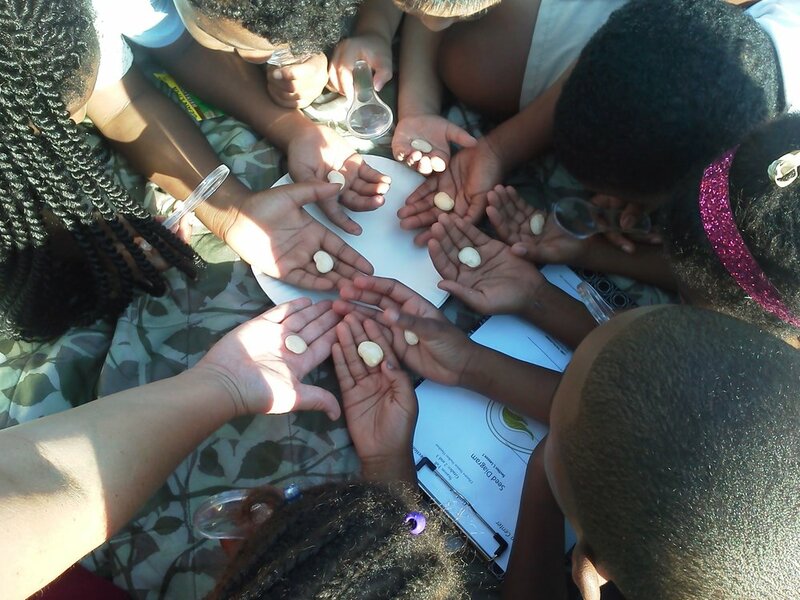 In order to sustain the recent revival in youth gardening, schools need community support. We can all pitch in our time, talents and resources to ensure the love of local carries on for future generations. Visit our website and check out our school garden map to find a garden near you! For more volunteer opportunities email us at youtheducation@civicgardencenter.org. Mary Dudley is the Youth Education Coordinator at the Civic Garden Center of Greater Cincinnati. She has worked as a botanical educator in Seattle, WA; Miami, FL and various cities in the Ohio Valley. Mary enjoys presenting at local and national conferences on the importance of getting children outside and working with plants. Her research has been published in both scientific and educational journals. In her free time, Mary loves traveling to new places to investigate the flora, taste new foods and research local agricultural practices. Abby Strietmann is the School Gardens Assistant at the Civic Garden Center. Abby holds a Master of Arts in Teaching and Curriculum from Michigan State University and Bachelors of Science from Xavier University. Prior to beginning her position with the Civic Garden Center in August of 2016, Abby was an upper elementary guide in northern Michigan. While teaching, she helped to develop and implement school compost, garden, and animal husbandry programs for her students. Older PostWhat’s Sustainability Got to do With It?